People are more likely to hold onto clothing when it has sentimental value, and custom jerseys from old sports teams are both personal and sentimental. Customized jerseys are a nice souvenir for team members and, since they are likely to hold onto the jerseys as mementos, this prolongs the brand visibilitywho doesn’t love custom attire? For more than 30 years, protective apparel made from DuPont™ NOMEX® brand fiber has provided superior thermal protection from flames, flash fires and electric arcs. The unique molecular structure of NOMEX® makes it inherently flame resistant. Garments of NOMEX® protect workers in the petroleum, petrochemical, chemical, and electric and gas utility industries. Professional firefighters, racecar drivers, U.S. military personnel and NASA astronauts also wear garments of NOMEX®. Inherent thermal protection that cannot be washed away. Durable and resistant to abrasion, tears, and chemicals. Does not burn or melt and drip. Provides permanent protection that won’t wash out or wear away. Forms a tough, protective char when exposed to flame, and stays supple until it cools. Meets the NFPA 1975 for firefighters’ stationwear. Meets the ASTM F1506 standard for workers’ apparel as protection from electric arc exposure. Widely used by petroleum, petrochemical, chemical, and utility industries, as well as firefighters. Garments made with NOMEX® thermal technology are extremely durable and resist abrasion, tears and chemicals. They’re also an excellent value, lasting three to five times longer than other standard and protective fabrics, including 100% cotton and flame-retardant treated (FRT) cotton. In lease, rental and purchase programs, the out-standing wear life of garments of NOMEX® IIIA can contribute to bottom-line savings. Workers must be constantly aware of static electricity hazards and must use proper grounding procedures, both for themselves and equipment. As an added margin of safety, garments of DuPont™ NOMEX® IIIA reduce the clothing’s contribution to static charge buildup on the body. NOMEX® IIIA is made with a static-dissipative fiber, which reduces the static generated in both fabric-to-fabric and fabric-to-surface rubbing, even in low humidities. NOMEX® IIIA also reduces static cling, which makes the garment more comfortable to wear. Garments of NOMEX® are as comfortable to wear as other work clothing. Lightweight, breathable fabrics of NOMEX® brand fiber are designed to transport moisture away from the skin, which helps wearers feel cool and dry. Side-by-side wear tests show that fabric weight is the single greatest factor in controlling garment comfort, and that the lightweight comfort fo NOMEX® is often preferred over other protective fabrics. In addition, protection apparel of NOMEX® is available in a variety of fabric weights to suit any climate. Flame-resistant protective apparel of NOMEX® combines style and functionality with a professional appearance. NOMEX® is available in a wide range of colors and garment styles, including jackets, parkas, slacks, jeans, shirts, polar fleece and switching coats. Garments of NOMEX® are easy to launder and rarely need pressing. Normal home or commercial laundering and dry cleaning techniques provide good results. The protection is permanent and cannot be washed out or worn away. by Chris Woodford. Last updated: May 7, 2018. It's a racing driver's worst nightmare. You come down the straight at over 200mph (300 kph), a tire blows out, and you skid off into the crash barrier. You survive the crash but the energy of the impact generates enough heat to make your fuel tank explode. Suddenly, the car that could have carried you to victory has turned into a fireball. You manage to escape, but now there's another terrifying threat: your overalls catch fire! Fortunately, you're wearing an inner body-suit made of an amazing flame-resistant material called Nomex®. So, as you pelt from the car, the fire goes out all by itself. Shaken but unharmed, you owe your life to an piece of amazing chemical technology. Let's take a closer look at how Nomex works and some of the other things it can be used for! Photo: A soldier puts on a Nomex® hood and a flameproof suit. Photo by Ryan C. Matson courtesy of US Army. Artwork: The chemical structure of Nomex. It's a polymer built by repeating this ring-based unit (monomer) over and over again. Synthetic means made in a chemistry lab. Synthetic textiles (such as polyester, nylon, and so on) are artificial, human-made chemicals cooked up by chemists; they're the opposite of natural fibers such as wool (from animals) and cotton (from plants). 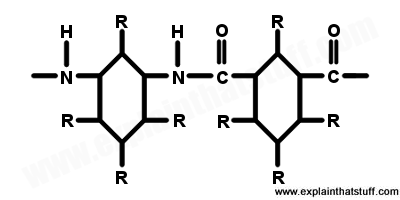 Aromatic means the molecules in nomex are based on connected rings of atoms rather than straight-line branched structures. Polymer is the proper chemical term for a plastic. It usually means a giant molecule made from many ('poly-') repetitions of a basic unit called a monomer ('-mer'). In short, what we have in Nomex is a man-made textile whose ring-like monomers are bonded together into tough, long chains to make immensely strong fibers. Break Nomex up and sort it into its atoms and you'd have four neat piles of carbon hydrogen, oxygen, and nitrogen. 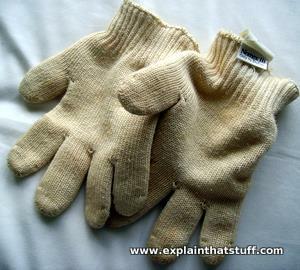 Photo: A pair of Nomex® gloves like these could make nasty oven burns a thing of the past. Aromatic polyamides such as Nomex are often called aramids for short. Kevlar® (another DuPont textile) is also an aramid, but with a slightly different chemical structure. If you're interested, the full chemical name of Nomex is poly (m-phenylenediamine isophthalamide), while Kevlar is poly (p-phenylenediamine terephthalamide); Nomex is a meta-aramid polymer while Kevlar is a para-aramid polymer. Aramids are made in a two-stage process. First, the basic polymer is made by reacting together organic (carbon-based) substances to form a liquid. In the second stage, the liquid is spun out to make solid fibers, which can then be woven into textiles or converted into sheet form. Nomex generally comes in three kinds. It's either used by itself (as 100 percent Nomex), blended with up to 60 percent Kevlar, or blended with Kevlar and some anti-static fibers. In this last form, it's known as Nomex III. Photo: Left: Turn Nomex gloves inside out and you can see how very thickly woven they are. Although they look much like ordinary woollen gloves, wool alone could never give such amazing heat protection. Right: Inspect the label carefully and you'll see this is actually Nomex III, which is roughly 95 percent Nomex, 5 percent Kevlar, and a little carbon fiber to reduce static. Two superb properties of Nomex make it a perfect protective material for race-car drivers. Although Nomex burns when you hold a flame up to it, it stops burning as soon as the heat source is removed. In other words, it is inherently flame resistant. Just as important, the thick woven structure of synthetic fibers is a very poor conductor of heat. It takes time for heat to travel through Nomex; hopefully by that time, you're away from the flames and out of danger. In the original Nomex patent, five samples of the material were compared with five similar samples of cotton (the control) in a basic flame test. The cotton samples caught fire in just 2 seconds and burned for 13–430 seconds; the Nomex ignited much more slowly (after about 4 seconds) and stopped burning after a mere 5 seconds when the flame was removed. Apart from high heat resistance and flame retardance (it doesn't melt or drip), the tough, woven structure of Nomex is extremely strong and doesn't react with water. What is Nomex used for? 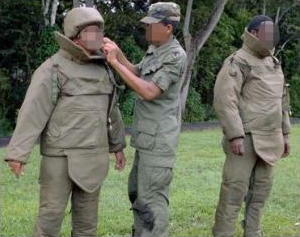 Photo: Ready for battle: soldiers put on body armor made from Kevlar and Nomex and used by explosives experts. Photo by courtesy of US Army. Nomex is best known as a barrier to fire and heat. Apart from race-car drivers, it's worn by astronauts, fire-fighters, and military personnel. It's also widely used in more mundane ways, such as in my household oven gloves. In sheet form, heatproof Nomex finds many uses in automobiles, including high-temperature hoses and insulation for spark plugs. But Nomex isn't just useful for protective clothing. The molecular structure that stops heat passing through stops electricity flowing through it as well. That means Nomex is an extremely poor conductor—almost a perfect insulator, in fact. Nomex, made into the form of a paper sheet or board, is a superb insulating material for all kinds of electrical equipment, from motors and generators to transformers and other electrical equipment. For these applications, Nomex is often laminated with Mylar® (polyester film) to make a stronger, tougher insulating material that works at high temperatures without the individual layers coming apart. Two-ply Nomex-Mylar laminate is called NM; three-ply is known as NMN (where the Nomex goes either side of the Mylar); and four ply is NMNM. Like Kevlar, Nomex is both very strong and very light, so it's often used in aerospace applications. Nomex sheet is widely used to make the honeycomb reinforcement inside helicopter blades and airplane tail fins. Photo: Nomex isn't the only fire-retardant fabric. Textiles used to cover chairs are often made from fire-resistant polyesters and other materials. This simple demonstration in Think Tank (the science museum in Birmingham, England) shows very clearly how fabrics like these can save lives. On the left, we have a chair made from ordinary fabric. A cigarette or match burn sets the fabric alight very quickly and gives off toxic fumes. Had this fire been left to burn, the whole chair (and the rest of the room) would have been completely destroyed. 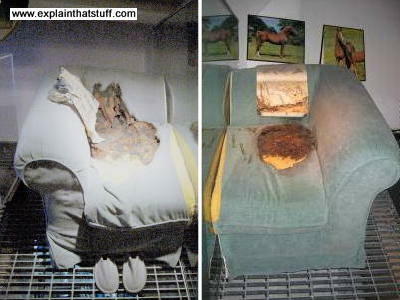 On the right, a chair made from fire-retardant fabric burns much slower. Often the fire goes out before too much damage is done. The credit for this excellent invention goes to Dr Wilfred Sweeny (1926–2011), a Scottish-born scientist working at the world-famous DuPont laboratory in Wilmington, Delaware that also spawned nylon and Kevlar. While researching polymers, he developed one with with particularly good thermal properties that could be woven into a very tough fiber. Since Nomex was introduced in 1967, it has saved the lives of countless firefighters, pilots, soldiers, industrial workers—and, of course, racing drivers! What Are the Benefits of Personalized Sports Jersey? 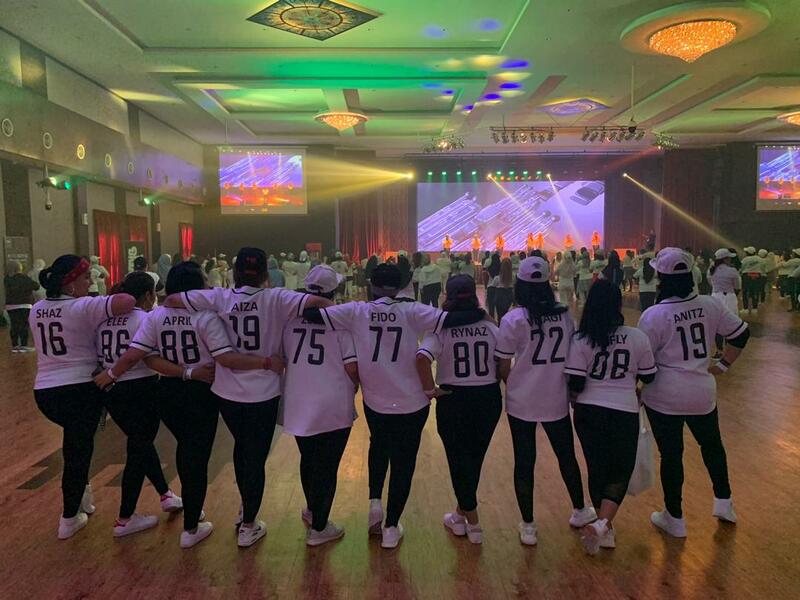 Uniformity – Instead of just settling for plain-colored shirts or sports apparel which doesn’t have anything printed on them; tailoring customized jerseys for your team can result in team uniformity. Of course, wearing shirts of the same color or style makes the team look more as one, but with the logo and their team details on, the jersey would look more official. The overall clean and uniform look adds a nice touch of professionalism as to how the team represents themselves. Team Unity – When team members wear their uniform or team jerseys, they feel more connected with the rest of the team. Wearing something which they know represents a whole team and not just themselves as individuals can definitely make them act accordingly. This helps reinforce a strong team spirit and they become representatives of the brand or sponsor they stand for. Recognition – For a team, being recognizable as you play in the field is a necessity. It helps the fans as well as the referees see the players much better. The team colors along with the team logo ought to be clearly emblazoned on the jersey that players are wearing. This is great not just for the players but for the team’s management as well! They can get their logo on the jerseys and people will remember this logo whenever the players wear their jerseys. Style – The design that personalized sportswear has makes them edgy, trendy, and stylish overall. In sports, channeling that competitive vibe makes a team seem look more formidable too. When teams choose to have personalized jerseys they can make themselves appear stylish and polished on the field. This helps set a confident aura about the team members and even opposing teams can feel this energy radiate from them. Freedom of Design – Some designs can be complex while others are simpler. When sports teams get in touch with people who can make customized prints for them, they can have almost anything printed on their sports apparel and rest assured that all the details will be there and would look exactly how they would like it to. Since there is a great amount of freedom concerning the designs of the shirts, teams can be sure that their designs will be as unique as they want it to be! Out in the field, it is important to be able to set yourself apart, and having your personalized sports apparel can really help accomplish that. If you’re concerned about the feel of your sublimated jersey, just remember that you have options to choose from, like Poly Spandex,Cotton Lycra,Microfibre + Stretch, Drifit Mesh,Interlock, Pique,Eyelet and Hexagon. All fabrics are moisture wicking and lightweight, so no matter which one you decide to go with, it will keep the moisture to a minimum & keep your players cool. now at RM 6 per pcs. NO MOQ . ANY Quantity.